I approached what looked to be a desolate warehouse on 1600 block of Fort Street in Detroit’s southwest industrial neighborhood; a district historically known for housing manufacturing factories and retail warehouses. The area is now primarily vacant and on the verge of redevelopment. 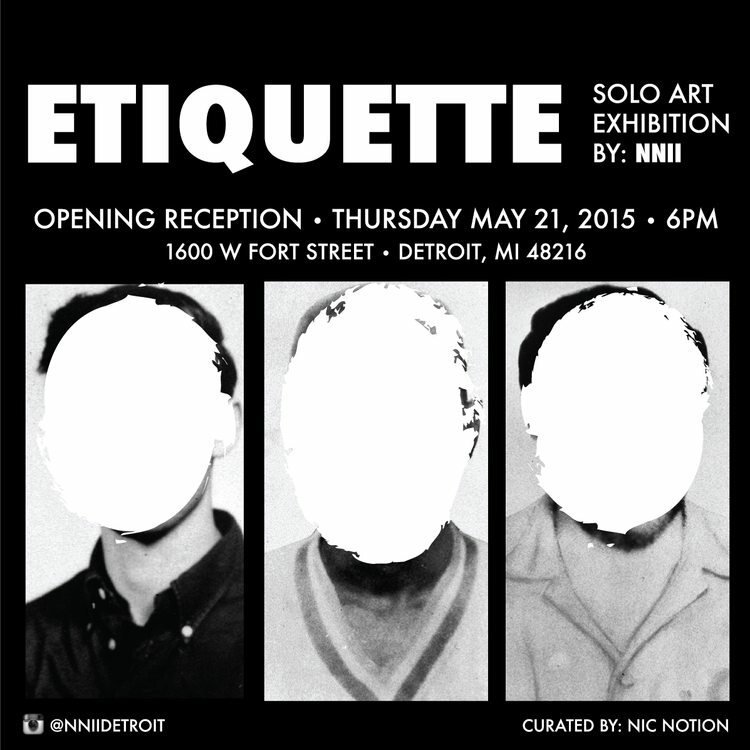 Nonetheless, interdisciplinary artist, cultural contributor, and gallery professional Nic Notion envisioned the area as the perfect space for his most recent solo show Etiquette. 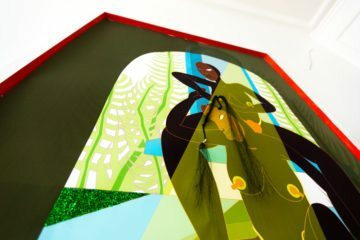 Prior to its opening, Notion, also known asNNII, shared with me a descriptive plan for the layout and theme of his show, which included his paintings, the specific type of music that was to be played and even the texture of the air in the space. The ambitious vision was only one that he could execute. I attended the opening of Etiquette on the evening of May 20th, one of the first days of the year where the weather was permitted to socializing beyond heated walls. Prior to entering the warehouse where the works were housed, I was greeted by two port-a-potties situated along the exhibition entrance. An odd place for the bulky objects, I thought. However, in retrospect, I learned that the placement of the decrement vessels were very intentional. Inside the warehouse, I first recognized an all black slightly burned jaguar automobile sans the wheels, propped on a golden bucket and a few slabs of brick. Artificial smoke elevated from under the car’s hood, creating a mystified atmosphere throughout the entire space. In a city where car theft is common, the sight of an immobile automobile was all too familiar. The car rested in the middle of the exhibition space surrounded by several black and white landscape paintings on canvas, neatly adorned on the inner walls of the space. Before I recognized the visual works, my sound sensory was heightened with instrumentals by the late Detroit producer J Dilla spun by a turntablist, Jay Daniel, situated subtly in a small corner of the space. The show featured several stark black and white landscapes, thoughtfully spattered across large canvases. Notion revealed that as he began to create this particular series of work which depicts neighborhoods in ruins made in large part through the destruction of or by the police, contemporary realities began to mimic his paintings through unrest in New York City, Ferguson and Baltimore. His prophetic approach to simplified landscapes identifies disparities between race, class, and colonialism. 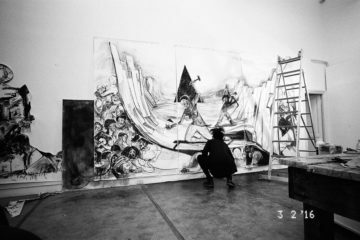 Consequently, ‘man’ is signified through several silhouetted figures outlined in white on predominately black canvases, similar to that the chalk-like contour in the aftermath of a murder scene. Despite the melancholy undertones at first glance, Notion proposes that there is a sense of divinity surrounding the figures. The chalk outline could also be viewed as a brightened halo, comparable to the one adorned by Jesus in Christian iconography. The post apocalyptic scenes of outlined figures dominate police vehicles that are nestled between abandoned buildings, which may cause one to question whether the figures represent the good or the bad. 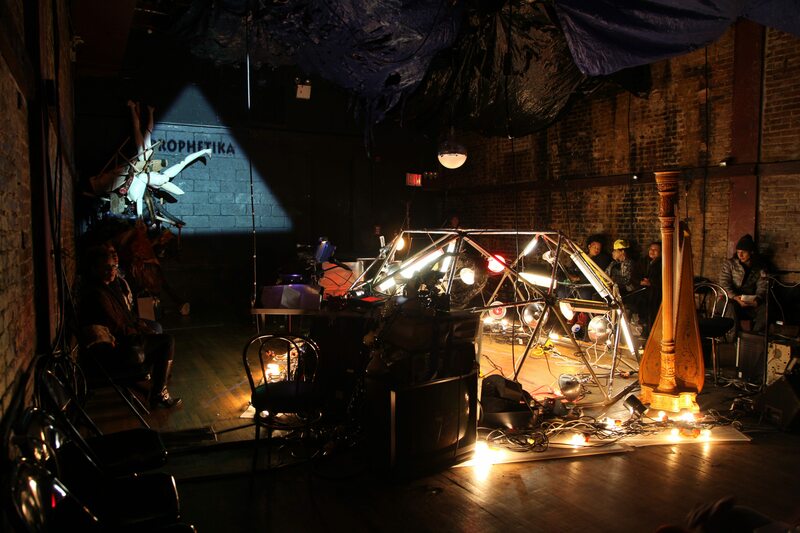 The collection of two dimensional scenes on canvas, accompanied by a solo saxophone performance by Detroit musician Mike Monford, Hip Hop music and a burning man-made object (no longer available for use) in the isolated warehouse, suggested the narrative of post apocalyptic tyranny. 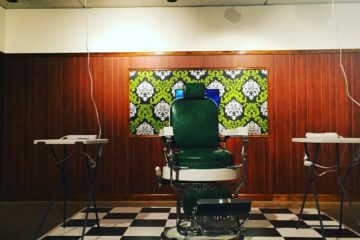 Etiquette, was not just an exhibition of works but rather a refreshing, yet melancholy experience, particularly because it reflected a city that is undergoing a cultural shift of transplants overshadowing a city’s natives. 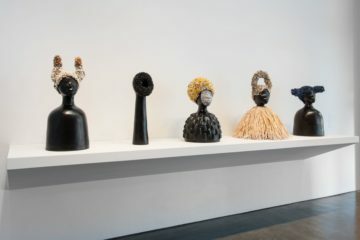 A situation that is most akin to colonialism and the marginalization of the native civilians – Notions’ works and deliberate efforts to cull together an elusive collection of analog and instinctive performances and art works resonate widely with the sign of the times in contemporary Detroit and many cities going through similar transformations.